The hip plays an important role in supporting the upper body weight while standing, walking and running, and hip stability is crucial for these functions. The femur (thighbone) and acetabulum (hip bone) join to form the hip joint, while the labrum (tissue rim that seals the hip joint) and the ligaments lining the hip capsule maintain the stability of the hip. Injury or damage to these structures can lead to a condition called hip instability. 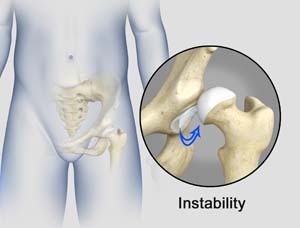 Hip instability happens when the hip joint becomes unstable causing various symptoms. Your doctor may start you of f on a conservative/non-operative treatment approach such as protected weight bearing (crutch, cane, or wheelchair) and referral to a physical therapist for exercises. A physical therapist will instruct on special exercises, focused on improving your strength, balance, and flexibility.